Release Date: April 28th, 2006 by Columbia Pictures. The Cast: Robin Williams, Cheryl Hines, JoJo, Josh Hutcherson, Jeff Daniels, Kristin Chenoweth, Hunter Parrish, Chloe Sonnenfeld, Alex Ferris, Will Arnett. BASIC PREMISE: Bob (Williams) takes his family by a recreational vehicle to vacation in Colorado and meets a strange family of campers along the way. ENTERTAINMENT VALUE: Robin Williams tries to go back to being funny as Bob, a family man who deals with family, strange camper friends and work-related stress all during a family vacation. His wife (Hines) and two teenage kids (JoJo and Hutchenson) have no idea that he chose to travel to Colorado for an important work meeting. Of course, acting just like typical teenagers, his kids annoy him throughout the trip in a variety of ways. Already within the first half-hour, the plot includes excrement as a means of generating humor, but comes across as very low-brow and juvenile. Unfortunately, Williams has too-few funny moments in a stale script by Geoff Rodkey that heavily relies on physical comedy. How many times can you laugh at the RV crashing through all sorts of objects? 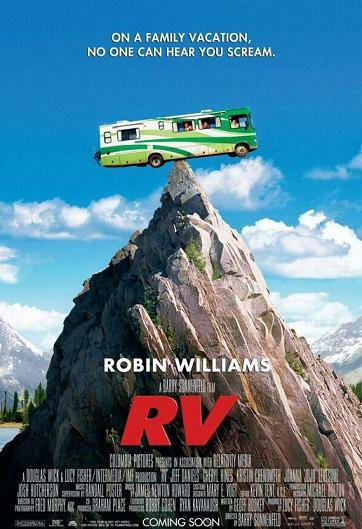 In a failed attempt to enliven the plot later in the second act, Rodkey includes some action involving Bob trying to save the RV from crashing on its way up a steep slope. Even Jeff Daniels as Travis, a strange but somewhat likeable father with an equally bizarre wife and kids, can’t save this movie from being painfully unfunny and unimaginative. INSULT TO YOUR INTELLIGENCE: Excessively juvenile humor. IN A NUTSHELL: Painfully unfunny with too much low-brow, unimaginative attempts at humor.